A canyon or gorge is a deep valley between cliffs, often carved from the landscape by a river. A famous example is the Grand Canyon in Arizona. In the southwestern United States, canyons are important archeologically because of the many cliff-dwellings built there, largely by the earlier inhabitants, the ancient Pueblo Peoples. A submarine canyon is a steep-sided valley on the sea floor of the continental slope. Many submarine canyons are found as extensions to large rivers, but many others have no such association. Canyons cutting the continental slopes have been found at depths greater than two kilometers below sea level. They are formed by powerful turbidity currents, volcanic and earthquake activity. Many submarine canyons continue as submarine channels across continental rise areas and may extend for hundreds of kilometers. The word canyon derives from the Spanish word (cañón). The word canyon is generally used in the United States, while the word gorge is more common in Europe and Oceania, though it is also used in some parts of the United States and Canada. The word defile is occasionally used in England, to signify a narrow gorge. A portion of Lower Antelope Canyon, a slot canyon near Page, Arizona. Slot canyons are very narrow canyons, often with smooth walls. Some slot canyons can measure less than one meter (3 feet) across at the top but drop more than 30 m (100 ft) to the floor of the canyon. Most canyons were formed by a process of long-time erosion from a plateau level. Canyons often form in areas of limestone rock. Limestone is to a certain extent soluble, so cave systems form in the rock. When these collapse a canyon is left, for example in the Mendip Hills in Somerset and Yorkshire Dales in Yorkshire, England. The cliffs often consist of harder rock strata, such as sandstones or granite, that are resistant to erosion and weathering. Canyons are much more common in arid areas than in wetter areas because weathering has a lesser effect in arid zones. Sometimes large rivers run through canyons as the result of gradual geologic uplift. These are called entrenched rivers, because they are unable to easily alter their course. The Colorado River and the Snake River in the northwestern United States are two examples of tectonic uplift. 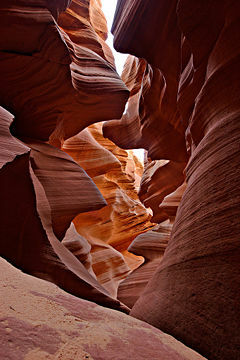 Slot canyons are found in many parts of the world, predominantly in areas with low rainfall. They are formed by the wear of water rushing through rock. 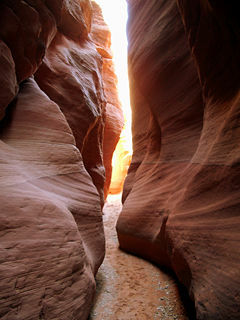 Most slot canyons are formed in sandstone and limestone rock, although some have also been formed in other rock types such as granite and basalt. Even in sandstone and limestone, only a very small number of creeks have formed slot canyons, based on a combination of the particular characteristics of the rock and regional rainfall. Submarine canyons are more common on steep slopes than on gentle slopes. They show erosion through all substrates, from unlithified sediment to crystalline rock. Various mechanisms have been proposed for the formation of these canyons, and they were subject to active debate, especially during the 1940s and 1950s. An early theory was that they were carved during glacial times, when the sea level was about 200 meters below what it is today, and rivers flowed to the edge of the continental shelf. Indeed, many (but not all) canyons are found offshore from major rivers. Yet, this mechanism cannot explain erosion reaching water depths as great as 3,000 meters, where canyons have been mapped. It has been well established (by many lines of evidence) that sea levels did not fall to those depths. It is now understood that several mechanisms have contributed to submarine canyon formation and development, even within the same canyon. The major mechanism of canyon erosion is now thought to be turbidity currents and underwater landslides. Turbidity currents are dense, sediment-laden currents that flow downslope when an unstable mass of sediment that has been rapidly deposited on the upper slope fails, perhaps triggered by earthquakes. There is a spectrum of turbidity- or density-current types ranging from "muddy water" to massive mudflow, and evidence for both these end members can be found in deposits associated with the deeper parts of submarine canyons and channels. Mass wasting, slumping, and submarine landslides are forms of slope failures (the effect of gravity on a hillslope) observed in submarine canyons. Mass wasting is the term used for the slower and smaller action of material moving downhill; and would commonly include the effects of bioerosion: the burrowing, ingestion, and defecation of sediment by living organisms. Slumping generally refers to rotational movement of masses on a hillside. Landslides, or slides, generally consist of the detachment and displacement of sediment masses. All are observed and are contributory processes. The Grand Canyon in Arizona, United States, and the Copper Canyon in Chihuahua, Mexico are two of the largest canyons in the world. Yet, the definition of "largest canyon" is rather imprecise, because a canyon system can be "large" in terms of its depth, length, or total area of the system. 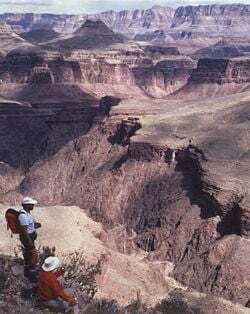 The definition of "deepest canyon" is similarly imprecise, especially if one includes mountain canyons as well as canyons that cut through relatively flat plateaus (which have a somewhat well-defined rim elevation). The inaccessibility of the major canyons in the Himalaya mountain range is one reason why they are usually not regarded as candidates for the biggest canyon. The Yarlung Tsangpo Canyon, along the Yarlung Tsangpo River in Tibet, is regarded by some as the deepest canyon in the world, and it is even slightly longer than Grand Canyon. Hence, it is regarded by many as the world's largest canyon, followed by the Kali Gandaki Gorge. If one measures the depth of a canyon by the difference between the river height and the heights of the highest peaks on either side, the Kali Gandaki Gorge is the world's deepest. The portion of the river between the Dhaulagiri and Annapurna massifs is at an elevation of between 1,300 meters and 2,600 meters, 5,500 to 6,800 meters lower than the two peaks in Nepal, Polung Tsangpo Canyon in Tibet, Cotahuasi Canyon (3,535 m deep and the deepest in the Americas), and the Tekezé gorge (2,000m+ deep, and deepest in Africa). Wire Pass leading into Buckskin Gulch, the longest slot canyon in the world, near Kanab, Utah. Some of the most well-known slot canyons are found in the southwestern United States. Other significant areas include the Sierra de Guara in northern Spain, the Pyrenees on the border of France and Spain, and the Blue Mountains in New South Wales, Australia. The state of Utah in the United States has the largest concentration of slot canyons in the world. Antelope Canyon, one of the most famous of the slot canyons, is located in Arizona near Page, on the Navajo reservation. There are also numerous slot canyons in the valley between US Route 89 and the Vermilion Cliffs in Arizona, and can be seen as one descends into the valley on US 89, but they too are on the Navajo reservation and are closed to the public. Several canyons accessible to the public are within Zion National Park and Death Valley National Park. The largest known area of slot canyons in Australia is in the Blue Mountains, west of Sydney. They occur in a narrow band of sandstone that runs roughly 30 km (19 mi) from east to west, and about 100 km (62 mi) from south to north. The majority of these canyons are in the Wollemi Wilderness and are difficult to access. A small number are regularly visited by canyoners on weekends in summer. Colca Canyon along the Colca River in Arequipa, Peru one of the deepest canyons in the world with 3269 meters. Columbia River Gorge in the Pacific Northwest of America. Cotahuasi Canyon along the Cotahuasi River in Arequipa, Peru, the deepest canyon in the world with 3535 meters. Swaan River makes many gorges in Pothohar plateau Pakistan. Gorges in the sandstone rock of the Blue Mountains west of Sydney in New South Wales, Australia. Congo canyon, the largest river canyon, extending from the Congo river, is 800 km (500 miles) long and 1,200m (4000 ft) deep. Zhemchug Canyon the largest submarine canyon in the world, also in the Bering sea. ↑ "Annapurna" (1:100,000 map), Nepal-Kartenwerk der Arbeitgemeinschaft für vergleichende Hochgebirgsforschung Nr. 9, Nelles Verlag, Munich, 1993. ↑ Ethiopia's Water Dilemma. World Rivers Review, August 2006. (pdf) Retrieved October 12, 2007. ↑ Zion slot canyons, Zion National-Park dot com, 2007. Retrieved October 18, 2007. ↑ Hadson canyon, Ocean Explorer, 2005. Retrieved October 18, 2007. Abbott, Lon, and Terri Cook. 2004. Hiking the Grand Canyon's Geology. Seattle, WA: Mountaineers Books. ISBN 0898868955. Beus, Stanley S., and Michael Morales. 2003. Grand Canyon Geology. 2nd ed. New York: Oxford University Press. ISBN 0195122992. Erickson, Jon. 2001. Rock Formations and Unusual Geologic Structures. Exploring the Earth's Surface. New York: Facts on File. ISBN 0816043280. Plummer, Charles C., David McGeary, and Diane H. Carlson. 2005. Physical Geology. Boston: McGraw-Hill. ISBN 007252815X. Whitney, Stephen. 1996. A Field Guide to the Grand Canyon. Seattle, WA: Mountaineers. ISBN 0898864895. This page was last modified on 9 January 2017, at 16:35.